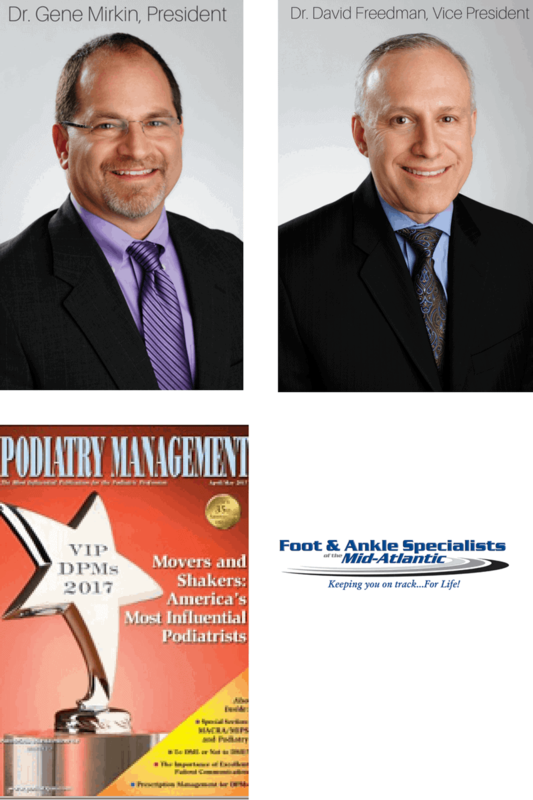 Dr. Gene Mirkin, President of Foot and Ankle Specialists of the Mid-Atlantic was recently named one of America’s most influential podiatrists by Podiatry Management Magazine. He was recognized for his leadership role in guiding the rapid growth of FASMA from 8 original partners to a super-group of 50 doctors and 31 offices–all within 5 years. FASMA has a unique integrative approach to Podiatric medicine, with ownership of a full-time Pathology lab, a high tech orthotic lab and six retail shoe stores. The organization’s Vice President, Dr. David Freedman, was previously recognized on the list released earlier this year. Dr. Freedman has distinguished himself as one of the foremost experts on Medical Billing and Coding practices. In 2001, Podiatry Management began publishing a list of the nation’s most influential Podiatrists. Unlike other professional publications that release lists annually, their list is published every five years, making it even more prestigious. Additionally, this year, all readers of Podiatry Management’s online newsletter, rather than just their editors, had the opportunity to weigh in. The list consists of well-known industry veterans as well as up-and-coming leaders in the field.